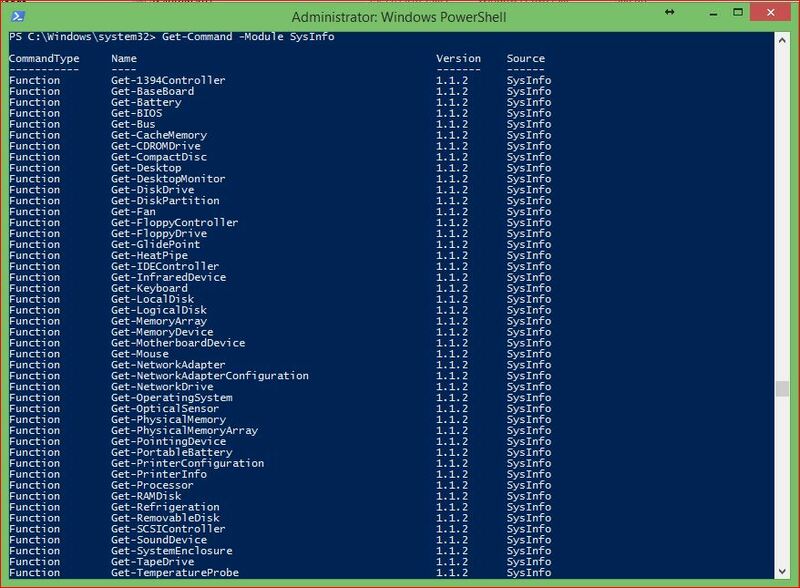 In this post we will see about the changes/additions of PowerShell Module SysInfo v1.1.2. For those who have not seen the information about SysInfo module, you can find it here. Let’s see the updates of this module. If the output of the command includes FreeSpace property, now it will also provide you the percentage of the free space and the used spaced. As you can see in the below example, C Drive has only 26% free space. On initial version you were able to use only WinRM protocol to retrieve the information from the remote systems. In this version you are also allowed to used DCOM protocol to get the information from the remote systems. by using the initial version you had to have PowerShell 3.0 and above in order to get the information from remote systems. Now with the use of DCOM protocol you are not forced to have PowerShell 3.0 and above. If you have an old system with PowerShell 2.0 you are still able to get the information that you need by using DCOM protocol. In order to do so, you need to use -Protocol parameter and select WinRM or DCOM as value of the parameter. If you do not use the -Protocol parameter, the default behavior of the cmdlets is to use WinRM. In the example below you ca see the how you are able to use -Protocol parameter. In this example you can see that I can retrieve the same information either using WinRM or DCOM protocol. In this version -Properties parameter is also available. Instead of showing all the information which sometimes might be confusing, the cmdlets now will provide you only with the basic information and if you need more you can select which properties you want to see all if you want to get all of them then you are able to use * to see them all. In -Properties parameters wildcards are accepted also. With the addition of -Properties parameter, cmdlets of the module will provide you a clearer results with the main properties of the object and if there is a need to get more properties you can specify the accordingly. In the below examples we will see the differences. Once more I am providing you below the list of all cmdlets included currently in the module. Hope you like SysInfo module and the additional features. You feedback and recommendations are appreciated. You are so cool man!! !